A few days ago, while writing a draft of a different blog, I made reference to and said “we’re well aware of the pitfalls around calling a vulnerability ‘theoretical’“! I wanted to link off to what I was referencing, a case where security researchers found a vulnerability in a big vendor’s products and were told it was “theoretical”. Of course, they in turn provided a working exploit for the vulnerability proving it wasn’t just theory. Thus, around 1995, the researchers took on the slogan “L0pht, Making the theoretical practical since 1992.” After digging, I couldn’t find a concise story of the details around that event, so I took to Twitter. Over the course of a couple hours, with input from many people, including some involved with the story, I collected the details. I told those in the conversation that if I had the information I would blog about it to better preserve that slice of history. My bad memory had me believing the vulnerability was in Sendmail, and that Eric Allman said it to Mudge. Royce Williams dug up the Sendmail exploit i was thinking of, and the header text from Mudge suggested I was on the right track. Next, Royce reminded me that I had actually referenced that vulnerability in a prior blog post from 2006… oops! Mark Dowd was the first to challenge me on that, saying he believed it was related to a vulnerability in Microsoft’s products, related to RAS or CHAP, and he was right about the vendor (which vuln it was specifically is still not confirmed). Next, Space Rogue, an original L0pht member chimed in saying he thought it referred to Microsoft and the NT/Lanman vulnerability, and that the 1992 part of the slogan simply referred to when L0pht was formed. DKP further confirmed this by digging into the wonderful Internet Archive, finding the slogan and quote on the L0pht’s page. L0pht, Making the theoretical practical since 1992. DKP continued digging and found the quoted in Bruce Schneier’s “Secrets and Lies”, and pointed out Schneier worked with Mudge on a MS-CHAPv2 vulnerability. 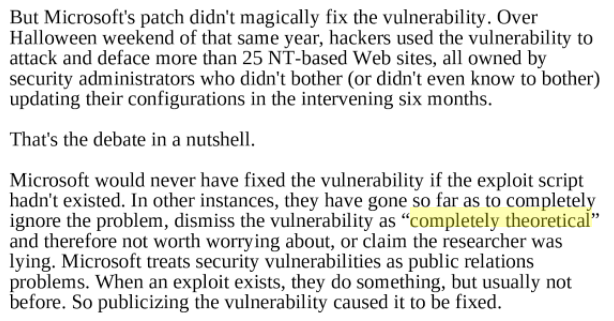 The paper on that vuln is from 1999 though, suggesting it wasn’t the “theoretical” vuln. With that, the “theoretical” vulnerability is mostly uncovered. It would be great if anyone could confirm exactly which vulnerability it was that prompted the response from Microsoft. If anyone else recalls details about this, please share! Having read a great deal of the info on this page and many of the links I get the impression there isn’t a list that details all the vulnerabilities that an admin can use to guard himself or his company. Isn’t there any you would recommend or is all hope lost?